The Baroosa Valley is located 60 kilometres from Adelaide and is famous for its red wine, especially its Shiraz. These vines are some of the oldest in the world. The vines were planted as early as 1847, and today Turkey Flat is still producing from these vines. Australia’s most famous wine, Penfold’s Grange is from this area. Other grape types are grown here, Grenache and Cabernet Sauvignon are the red and Riesling and Semillon are the white. Fortified wines are traditionally produced in this region. Mengler’s Hill Lookout and Sculpture Park is where you got to see the valley floor of this famous wine region and look out over miles and miles of spectacular scenery. Be sure to stop at Whispering Wall in Williams Town. It is part of an old dam and your secrets will be heard up to 140 metres away! 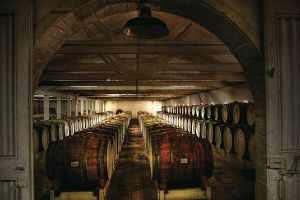 Seppeltsfield Winery is one of the oldest wineries in Australia and will be visited on most tours. Chateau Yaldara is a stunning vineyard, its Chateau is majestic, situated on a river with beautiful grounds. The Barossa is not all about wines, it is also about food. Maggie Beer is an Australian Icon, she not only grows the food but she cooks, bottles and sells it worldwide. If you start with great produce you end up with a great product. Be sure to visit Maggie Beer’s Farm Shop, you may run into Maggie if she is not travelling around Australia teaching people how to eat great wholesome food. You are in for a treat if you are in the Barossa on a Saturday Morning between 7.30 and 11.30, The Barossa Farmers Market is on in Angaston. Fifty plus stallholders sell their produce. You have to make a stop! 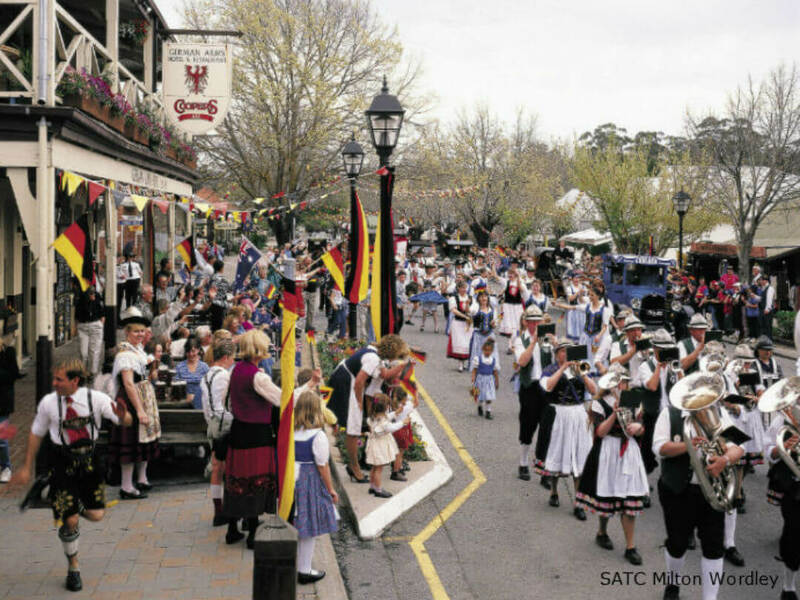 Hahndorf is only 25 minutes from Adelaide yet you would swear you were a million miles away. It is the oldest German settlement in Australia. 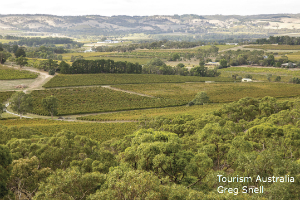 It is situated in the Adelaide Hills and attracts thousands of visitors each year. It is charming and has old fashion hospitality. At the same time, it has its eye on the future and has trendy wine and food venues. The main street is an attraction in its own right, the Elm and Plane Trees are over 100 years old and simply magnificent. There are old German Pubs to be enjoyed, eateries specialising in German Foods, crafts from the past but there are also restaurants, galleries, artisan’s shops, beautiful food outlets and more. A wonderful day out exploring the Barossa Valley and visiting the picturesque village of Hahndorf. Small group size and with some flexibility in the wineries visited. You will see a lot in this half day tour. Pass the main sights of Adelaide, drive up Mt Lofty before some free time in Hahndorf to explore this quaint German town. 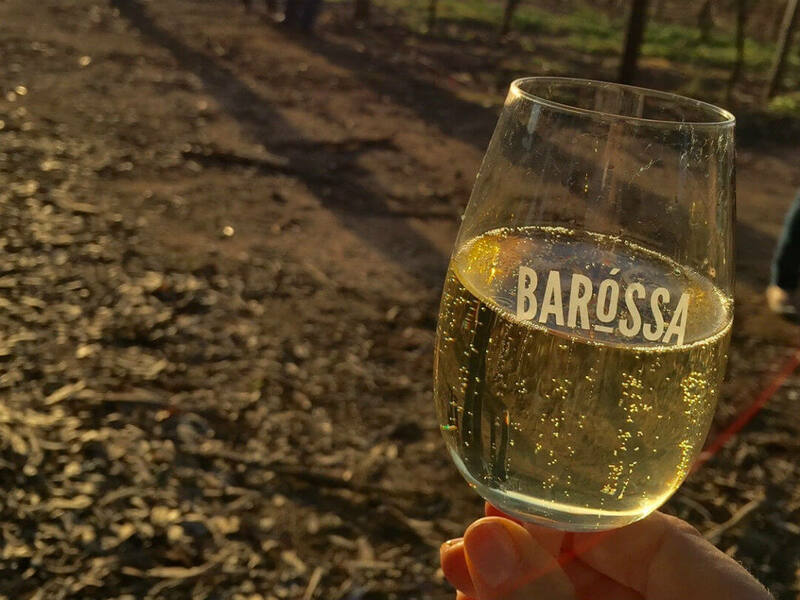 Visit two Barossa Valley wineries before heading to Hahndorf. This lovely little town has kept its German heritage with plenty of merchants offering you a taste of the towns heritage. 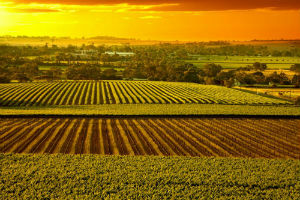 It is not all about The Baroosa you know, there is also McLaren Vale and the Clare Valley offering great wines as well. McLaren Vale produces wonderful Shiraz, Grenache and Cabernet Sauvignon as well as successfully embracing Spanish and Italian varieties as well. Some are Vermentino, Sangiovese, Tempranillo, Fiano, Mouvedre, Nero d’Avola, Aglianico, Montepulciano and Zinfandel. With 74 cellar doors you will need more than one visit! The Clare Valley is an hour and a half from Adelaide. It is a picturesque valley with loads of history. 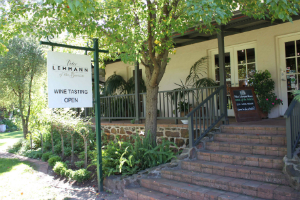 The region has over 40 wineries and most have wonderful charm. It is an area where wine, food, art and history go hand in hand. Clare Valley is Australia’s “Riesling Capital” so it is not surprising they have a “Riesling Trail” which is 35 kilometers of walking and riding trails from Auburn to Clare. The Clare Valley Winemakers were the first in Australia to invent the screw cap for Riesling bottles! A little more south from Mclaren Vale is Victor Harbor. That spelling is believed to be due to an error by an early surveyor. 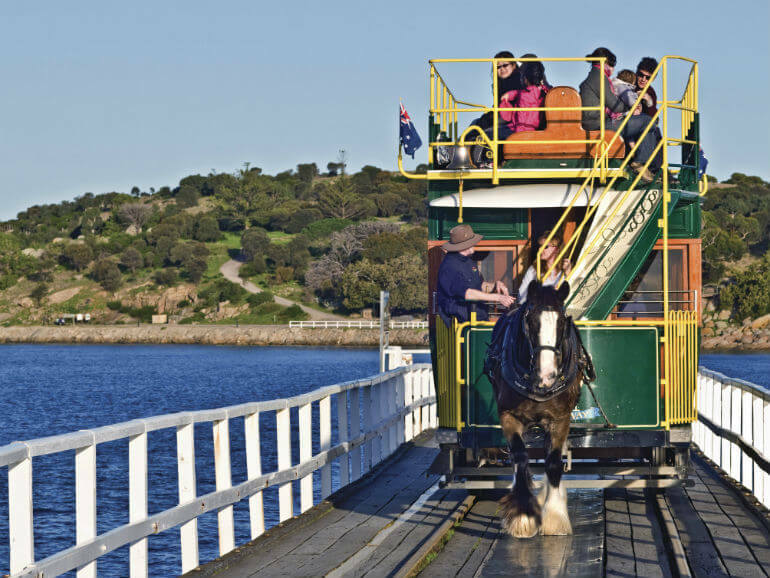 Most people that head to Victor Harbor go there to ride the horse drawn tram across to Granite Island where in season you may be lucky to see the migrating whales. The South Australian Whale Centre, is where you can learn about whales and whaling in the area. 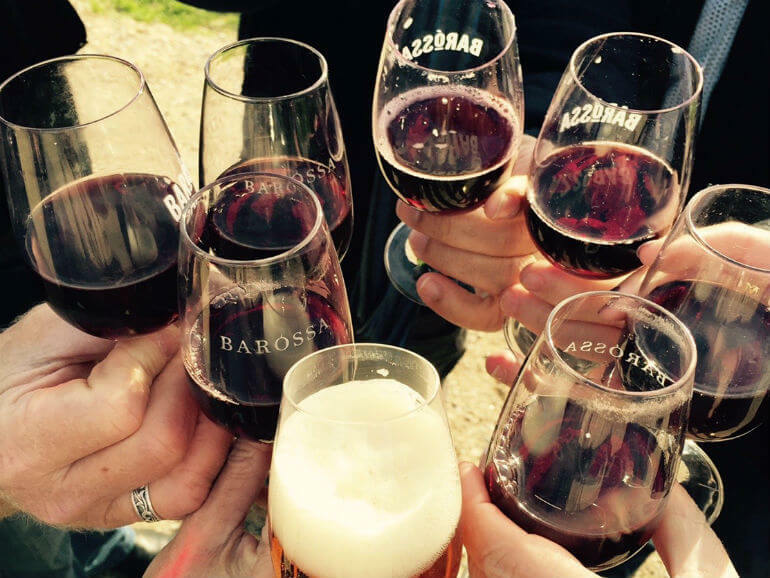 Visit up to 5 wineries on this flexible tour. The guide can help you choose the wineries to best suit your tastes. Good Food, Good Wine and a great day awaits you. Scenery and Wine together to make this a memorable day. 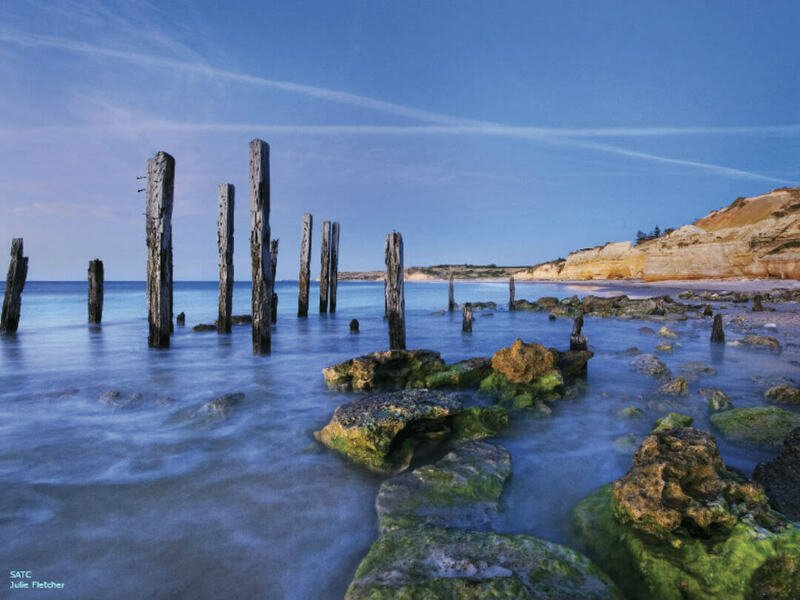 Visit the Fleurieu Peninsula including Victor Harbor, Goolwa (the paddle steamer town) and Whale Lookout at Port Elliot. This is a private tour for up to 6 passengers with a flexible itinerary to suit your preferences. 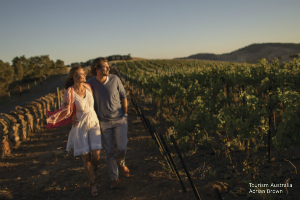 Clare Valley is Australia’s ‘Riesling Capital’ and one of the most exclusive wine growing regions in S.A.
You can certainly visit Kangaroo island in a day trip from Adelaide but being such a beautiful place why not spend a few days there? The island was named after it endemic population of Kangaroos but there is so much more to see on the island than just the kangaroos. 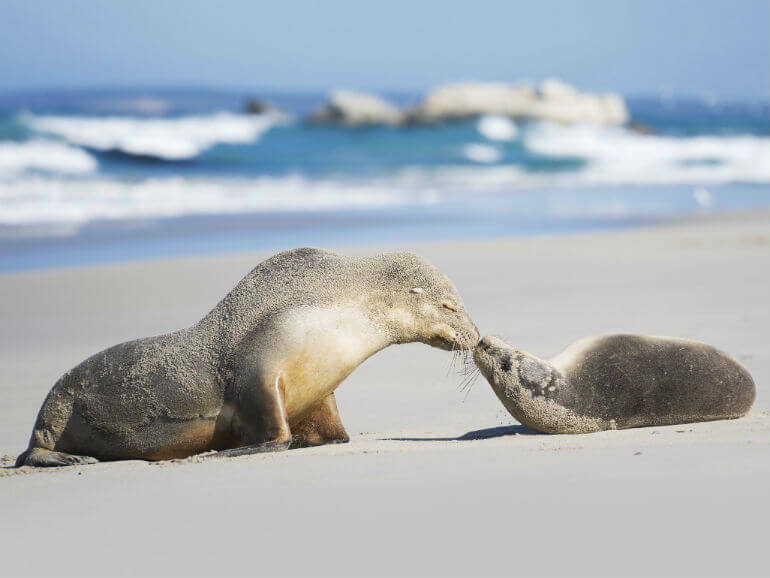 Seals, Sea Lions, Wallabies, Koalas, Echidnas and South Australia’s only population of wild platypus, and at the right time of the year migratory whales. A favourite place to watch for marine life is at Admiral’s Arch and the Remarkable Rocks, two of the most photographed places on the island. 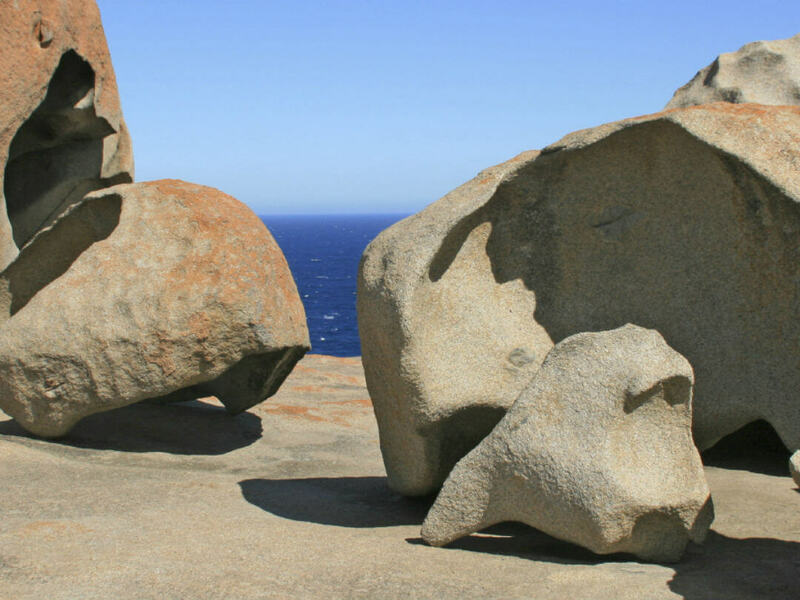 Want to find out more about Kangaroo Island? Including history, special events, travel information and plenty more. See our Kangaroo Island Things to Do Travel Guide. 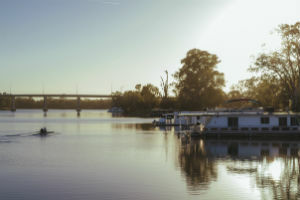 The beautiful old Murray River, it is the third longest navigable river in the world, behind the Amazon and the Nile. It is 2520 kilometres long, flowing through 3 States. 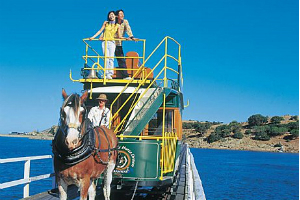 To experience the Murray River you need to be on it. It will be so peaceful, listening to the birds chatting to themselves, the hypnotic sounds of the paddles going round and round, and the slow pace will make your “real life” seem so far way! As you travel along the Murray River you will see some stunning scenery, orange cliffs, weeping willows (one of my favourite trees) and big red river gums. 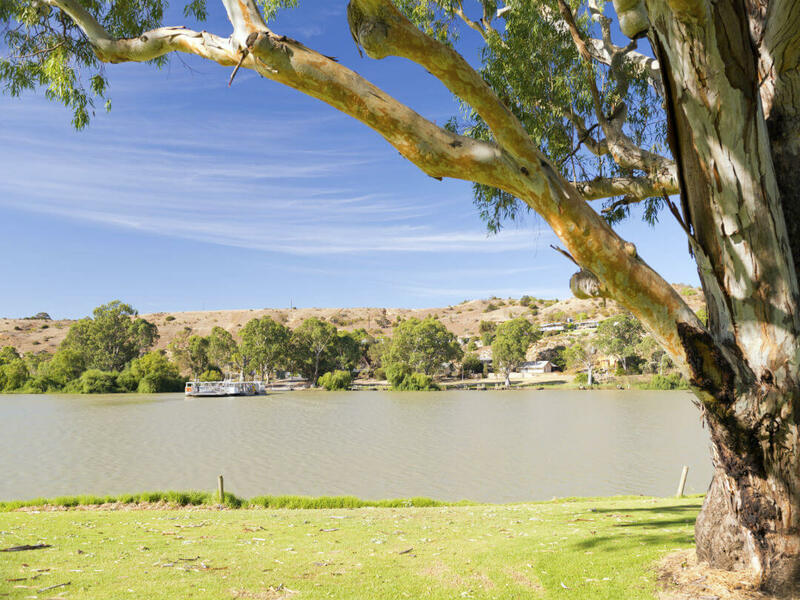 If time is not on your side, be sure to take a day tour but if you have a spare few days then there are some great extended tours along the Murray. She won’t disappoint with her dramatic backdrop, Australian flora and fauna, and a look into indigenous culture. 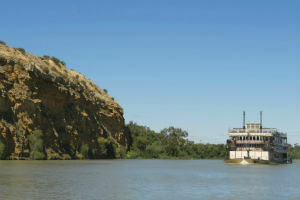 After a drive through the Adelaide Hills spend a relaxing day on the beautiful Murray river on the ‘Proud Mary’. Escape to the sounds of the river, the bush and the birds. 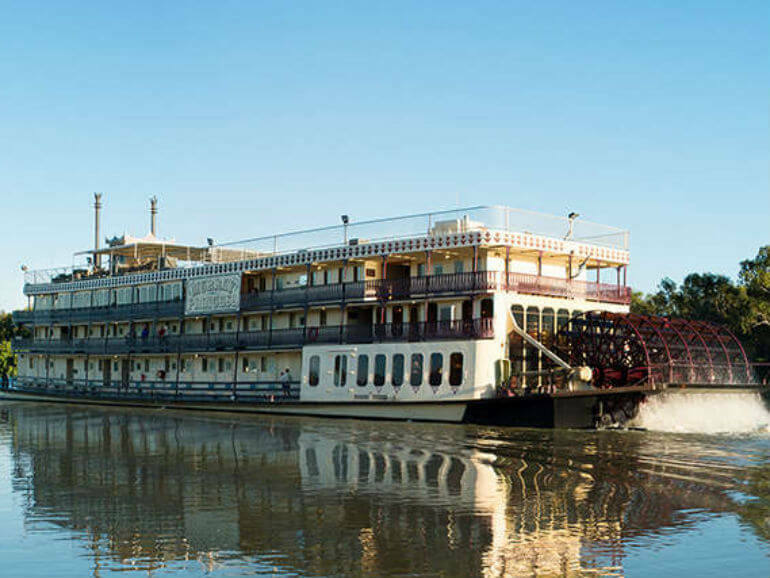 Step back in time for a week on a Murray River Paddle Steamer. cruise in luxury over 300 kilometres of the historic river. 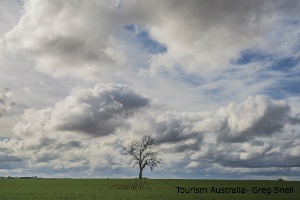 Includes wine tastings in the Barossa Valley. 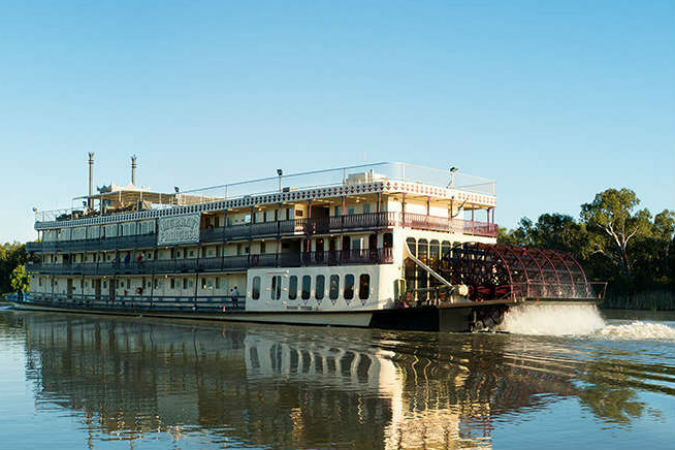 Three nights aboard the Murray River Princess is the perfect long weekend break. There is a nature walk and an optional zoo visit to enhance your time in the Australian Outback. Adelaide is beautiful, the CBD is surrounded by parklands. Adelaide has 29 parks, the beautiful Botanical Gardens are located minutes from Rundle Mall, I suggest you take time out from shopping. There are free tours of the gardens. In the heart of Adelaide, a block from North Terrace you will find Leigh and Peel Streets, locations for some of Adelaide’s great bars and restaurants. Leigh Street is traffic free so perfect for alfresco dining. Be sure to a have a look at Anister Street as well, it is not far away. Adelaide’s Central Markets are not to be missed. 80 plus stalls will be showcasing their wonderful produce. The owners always love to tell you about their produce so be sure to stop and engage with them. I have no doubt you will discover your new favourite food here. Another fun thing not to be missed is to see the 15,000 (I have read that there could be up to 50,000!) matchbox cars glued to the wall of the Rosina Street Carpark. Street Art is wonderful. 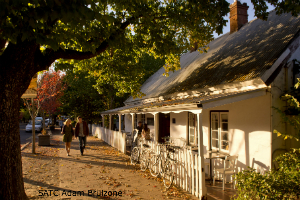 Approximately 10 minutes walk from the centre you will find the Adelaide National Wine Centre. The wine bar here has 120 different wines for you to taste. This is possible as a result of state of the art Enomatic wine preservation and dispensing machines. Translated, it means a system capable of preserving wine for up to 4 weeks and to serve it perfectly, giving everyone the chance to taste premium wines by the glass. I’ve tried it, it works! Staff are friendly and love helping you to understand the complexities of wine. 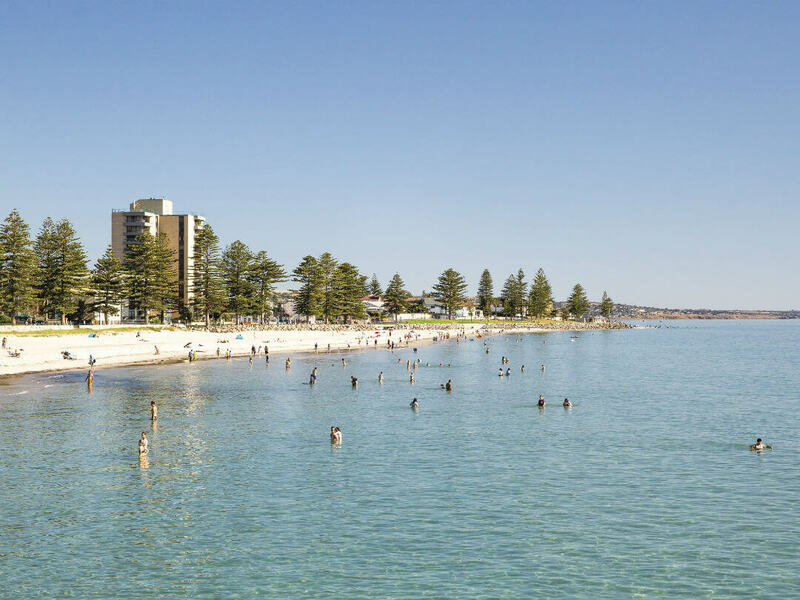 Adelaide’s beachside suburb is Glenelg about 10 kilometres south of Adelaide CBD. there is a tram connecting Glenelg to the city and on special events you can even ride one of the heritage trams. Taxi – Taxis are a convenient method for point to point travel in Adelaide. Throughout Australia dialling 13CABS (132227), or 131008 will put you in touch with the nearest Taxi service. Taxis can also be pre-booked. Trains – The train network runs from around 6am to 1.00 am weekdays and 7.00 am to midnight on weekends, although check the website for more details (Trains). There are more frequent services during peak times. As with any public transport network there can be congestion during peak periods. 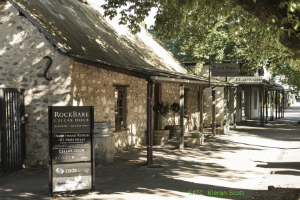 Breathe in the Barossa – Not a review of a specific Barossa Valley tour, more a review of the Barossa Valley in general. 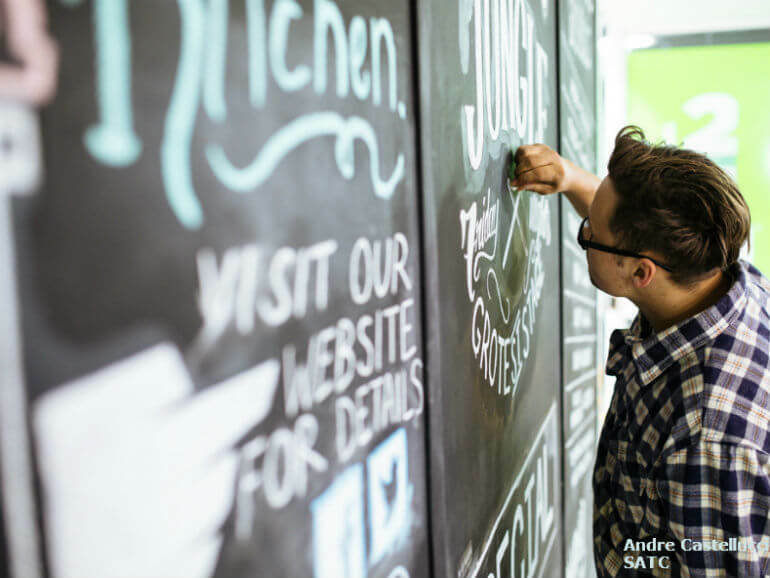 – There is so much to do in Adelaide, take a Barossa Valley Winery Tour, enjoy the sights from Mt Lofty or wander around the Adelaide Central Markets. 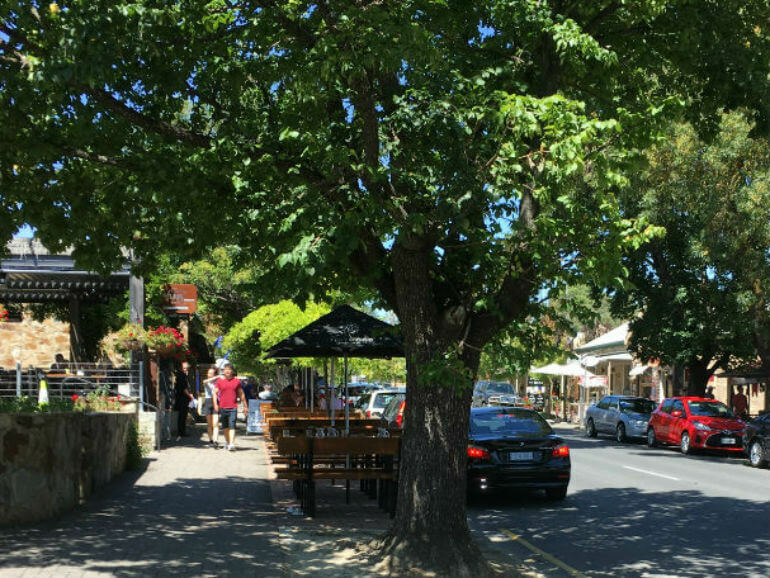 – Barossa Valley, Hahndorf and the Adelaide Hills are always very popular, and then there are the gems of Victor Harbor or Glenelg. There is so much to see and do in Adelaide as well as so many wonderful places to stay. As we discover interesting, unique or suitable accommodation options we will place them here so you can also research them and decide if they are suitable for you.